We will have a six wine flight, so please come to taste. We'll be waiting for you! $10 tasting fee waived with Club Membership, or $30 wine purchase. Dave is always on the lookout for cheeses to pair with our wine. Come Thanksgiving weekend and besides fantastic wine, taste the treats we have in store for you! 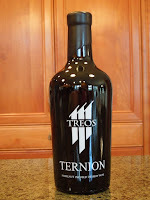 TREOS 2014 PINOT NOIR...NEW RELEASE!! THANKSGIVING WEEKEND, we will be tasting our newly released Pinot Noir 2014. It's a special Pinot not to be missed! Instead of our regular two pinots in 2014, the clones were so spectacular blended together...that we decided to make them all into this wonderful wine. This is a bold pinot with luscious cherry, berry and chocolate tones. It's earthy and spicy while complex and satisfying. Works well with any meat or cheese dish, as well as for sipping alone. Our 2017 Albariňo will be front and center in the tasting. The 2015 and 2016 Albariňos were given a 92 rating by Wine Enthusiast, along with an Editor's Choice award. This one is still waiting on its rating but we think it's as good or better. Come taste and get some while the supplies last! We also have some special sales to help you stock up for your holiday events! Oh my!! We do love our members and want to give them the very best deals :). Luscious Ternion...just right for an after dinner taste of celebration. 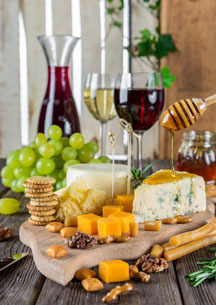 What could be better than a port-style dessert wine to ring in the holidays? Yum! Wine Club members always receive either the special sale price or their wine club discount, whichever is larger.